In Airport T4 take line C-1, towards Principe Pio. 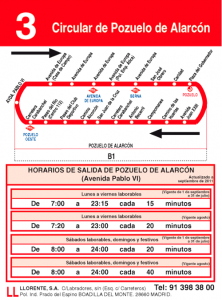 Once Principe Pio, take line C10 to VILLALBA and get off at Pozuelo Station (2 stops). Lasting of the trip: 1 hour approx. From the Airport station (line 8) until Nuevos Ministerios station, change to line 6 is made, towards Moncloa station. 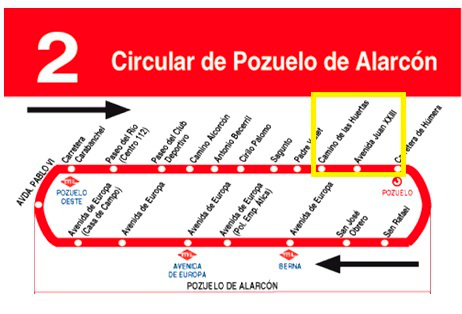 In the Moncloa bus station C / Huertas address, 2 (Hotel Pozuelo de Alarcón) is taken. 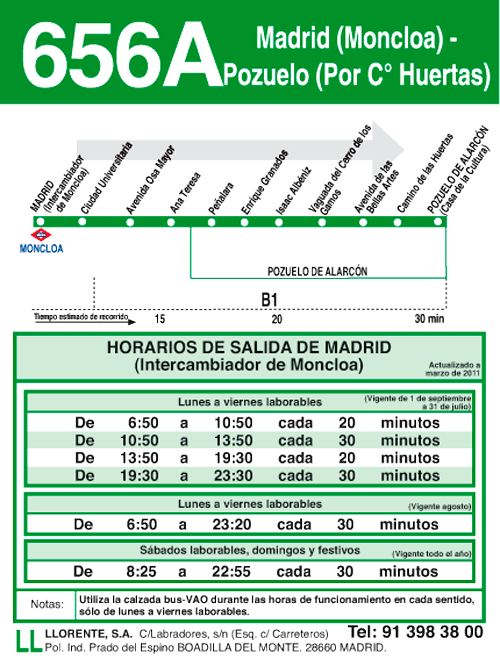 Once in Moncloa, head to the bus area. Take the bus 656A. This bus leaves us in front of the Hotel Pozuelo. Lasting of the trip: 1 hour and 15m approx. 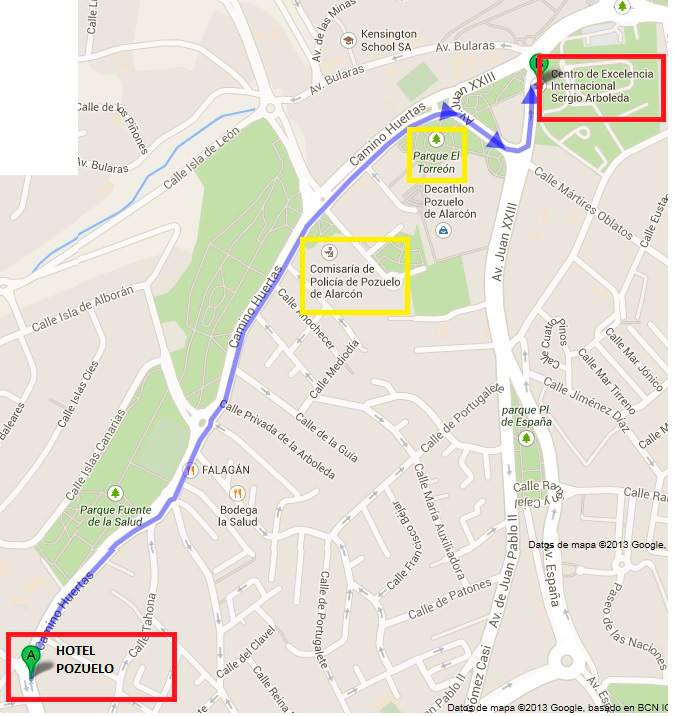 Alternatively take a taxi from the airport, direction Hotel Pozuelo. Lasting of the trip: approx 35m. 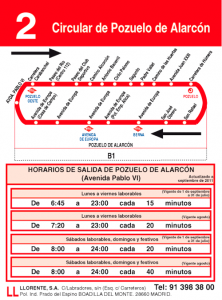 Depending on where you are going to stay in Madrid, you can choose what stations you need to get to your destination. In order to find out the destinations in advance, you should take a look at the three maps: Renfe proximities, Madrid proximities and Metro proximities. 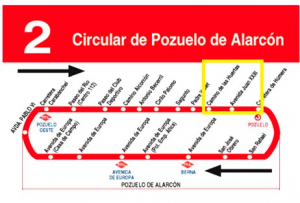 From T4 station Airport (line 8) we get to “Nuevos Misterios” (last stop). Expres Air bus, from T4 airport and Atocha destination. 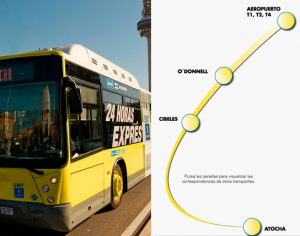 Another alternative is to take a taxi from the airport to Madrid center. The Price and time of the trip will dependo n the distance and the traffic. Within the limits of Madrid, it is posible to go by several means of transportation. 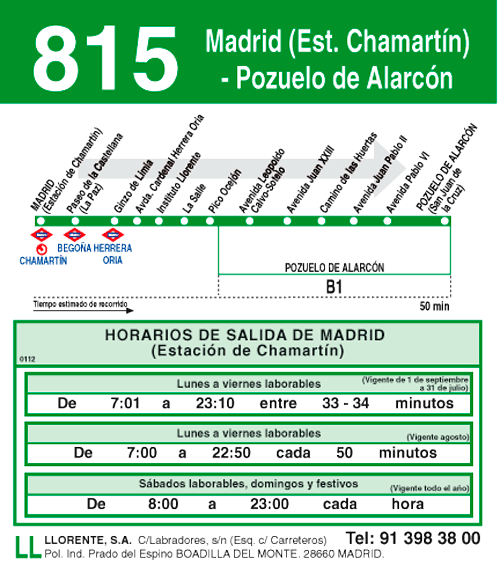 Madrid Proximities is the train service that connects the urban área of Madrid with the towns nearby. On weekdays there are about 1.385 daily routes, which in total transport 880.000 costumers. Madrid Proximities gets to most of the people in Madrid. 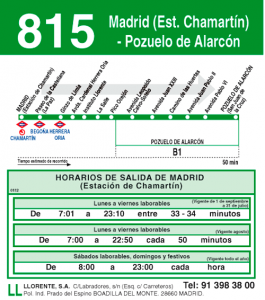 The net has a total of nine lines working passing by 89 stations connected to Madrid’s metro station. 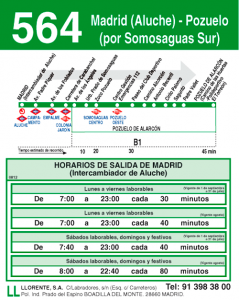 All routes start or pass by “Atocha”. The main stations of “Cercanias” are “Chamartin”, “Principe Rio”, “Nuevos Ministerios”, “Recoletos”, “Delicias”, “Embajadores”, “Aluche”, and “Mendes Alvaro”. The trains operate daily from 6:00 to 24:00. The frequency depends on the schedule (15min to 30min approximate). The single tickets price ranges from 1,10 to 3,40 based on the route you want to take. 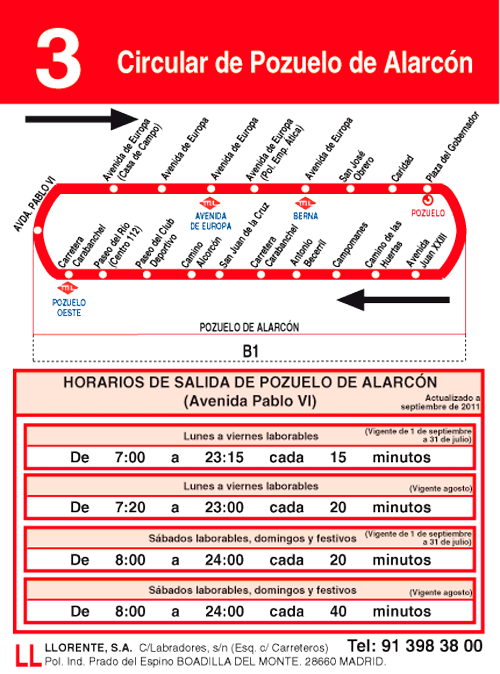 “Cercanias” Map with routes and stations. 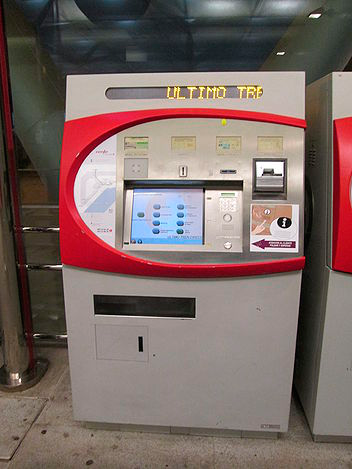 You can get the tickets at the vending machines in Renfe, they are located at the entrance of the stations. “Renfe Cercanias” has an app for iPhone™ and Android™, which alloes to look up the map, routes, stations and schedules at any time and place. Besides, it shows the route we want to follow from our starting station to our destination, and also shoes the time needed. 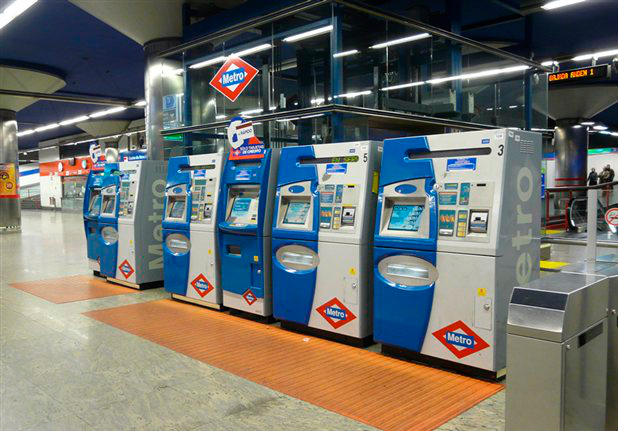 The Madrid metro system is the third oldest system in Europe (1919) after London and Paris. During 2011 there was a total of 634,5 millones of costumers. Up next we show the sifnificant logo of the metro. This logo not only identifies the metro but also points out your nearest station along the city. The Madrid Metro is fast and easy to go. It is composed by 13 lines and they get almost everywhere in the city. The lines are divided by colors and they are enumerated. The tickets are sold in machines located at the entrance of the Metro. Madrid Metro has an app for iPhone™ and Android™, which alloes to look up the map, routes, stations and schedules at any time and place. Besides, it shows the route we want to follow from our starting station to our destination, and also shoes the time needed. Another mean of transportation is the city buses system. The metro and bus tickets are the same. In case you do not have a ticket, you can pay the driver. 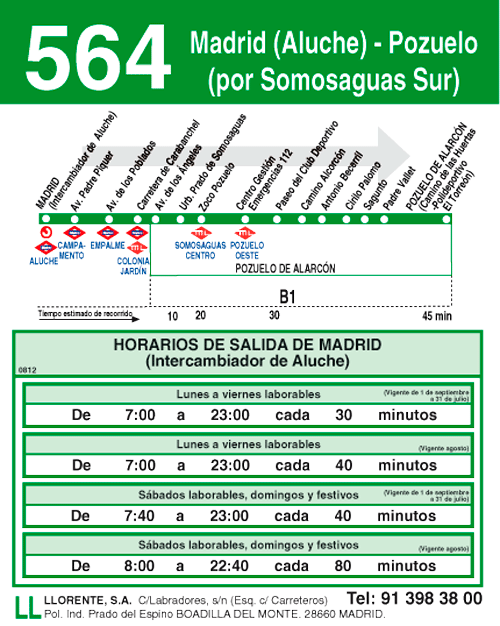 Most of the buses work every day from 6:00 to 23:00. The night shift buses (called the owls) work less frequently and pass by the Cibeles square. Their price is the same. Choosing this mean of transportation requires that you take into account the traffic. 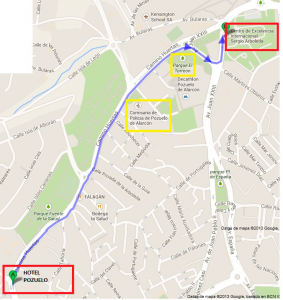 The Pozuelo Hotel is located 15 to 20 minutes away. It is very easy to get there. When you leave the hotel turn right, go straight forward by “C/camino de las Huertas”, passing by the police department, you will get to “El Torreon” where you need to turn right again. From Monday to Friday with an approximate frequency of 15 minutes. alternatives for the most usual places in Madrid are presented. Of Madrid) or the surrounding areas. Journey time: 45 minutes approx.. Journey time: 50 minutes approx. In any of the three options, as you can see in The schemes, it results easy to connect with the metro and train stations nearby. Journey time: 10 min aprox. 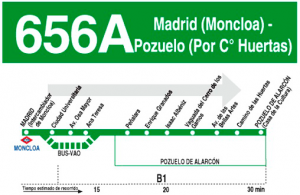 There is the posibility of going over from the hotel to take The 656A bus to Monclos (Madrid) From Monday to Sunday with frequency of 30 min aprox. Journey time: 30 min aprox. 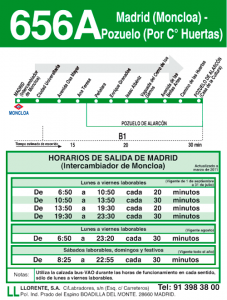 Journey time: Moncloa (the destiny to Madrid closer to Pozuelo de Alarcon) 20 min, aprox. The acces to any of these libraries is free, you just need to present the Passport and in case you want to check out a book. It opens monday to Friday from 9 in the morning to 9 in the evening and Saturdays from 10:00 to 14:00 hours. Pozuelo de Alarcon is a municipality in the province of Madrid (Spain) located 15 kilometers west of the Spanish capital. 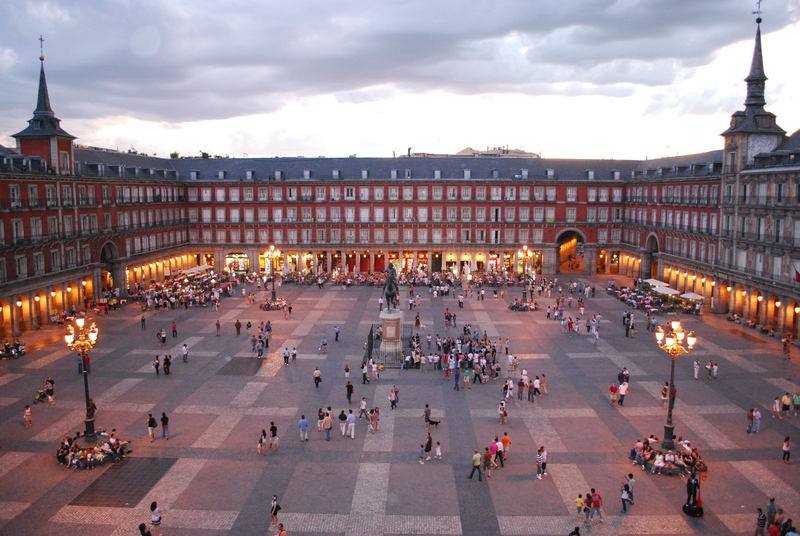 It is the richest municipality in the province of Madrid and the second state. This is a population linked to the city of Madrid from which it is separated by the House. It bounded on the north, east and south respectively Madrid with Madrid neighborhoods of El Plantio and Aravaca, House and Aluche; also south to the Ventorro del Cano (Alcorcón) and west Majadahonda and Boadilla del Monte. You can access this municipality from the capital by the A-6, for the M-503 and M-40. 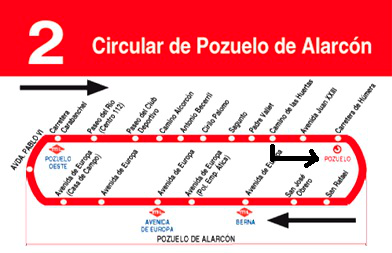 It has a station of Madrid Neighborhoods called Pozuelo, but also has the station of El Barrial-Centro Pozuelo Comercial, although it is located in the town of Madrid (district of Moncloa-Aravaca, district of El Plantío), provides Pozuelo service and especially the Hipercor shopping center that is located there. Restoration: The town offers a variety of tasty local, in which is evident the influence of traditional Spanish cuisine. “Callos a la Madrileña”, game dishes and old-fashioned spoon and grilled meats prepared by its proximity to Leon Castilian provinces, are some of the typical dishes of the area. Chicken, Pizza, Menu. Prices from 3- 7 euros. Monuments: Asunción de Nuestra Señora church ( inside is the chapel of Nuestra Señora de la Consolación, patron and mayor of our town ), Nuestra Señora del Carmen Church , Schoenstatt Shrine, Santa María de Caná church, Ayuntamiento , old area of Pozuelo ( Church, streets … ) . 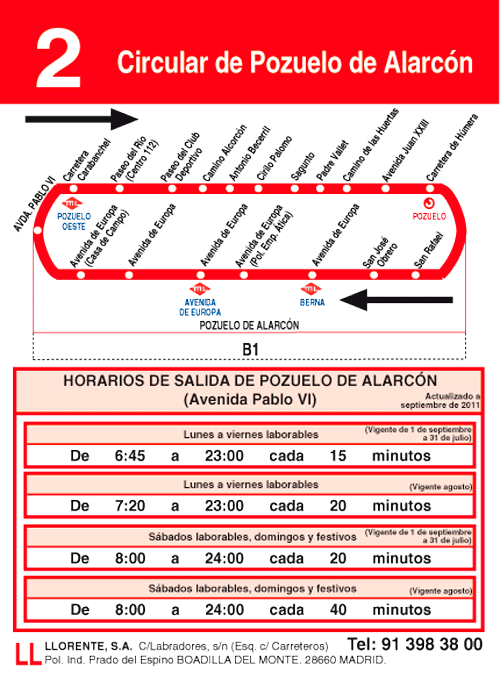 Information provided by Pozuelo Hotel ( churches , restaurants , leisure, etc … ) is attached. Madrid is a large city, with a population of about five million, and growing. It is located in the center of the Iberian Peninsula, on a plateau 650 meters above sea level. It has a continental climate, cold in winter and very hot in summer. Life there is so lively. There are many traditional cafes, chocolate factories,summer terraces, breweries and snack bars. It is easy to integrate, the locals are hospitable people, accustomed to welcoming people who arrived from across the country and around the world. It offers facilities for a variety of sports. The city offers many other leisure opportunities. There is a full range of art, especially relevant about painting. Madrid boasts three magnificent galleries, the Prado Museum, the Thyssen-Bornemisza Museum and the Modern Art Centre Reina Sofia. They are located in the same area already known as “The Art Triangle”. In addition to traditional museums and other tourist attractions, such as the Retiro Park or the Rastro (traditional second hand market) merit special attention neighborhoods such as the Austrias or the Plaza Mayor. 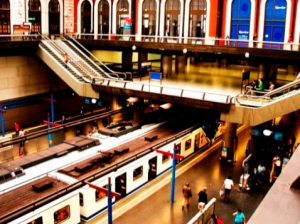 You can also make many interesting trips out of the city without having to travel long distances. El Escorial, the Pardo, Toledo, Segovia, Aranjuez, Chinchon, La Granja Ávila are located one hour or less from the city.